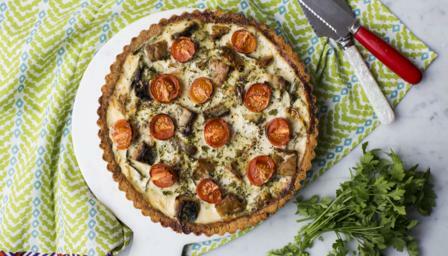 Hemsley and Hemsley’s lovely savoury tart uses homemade gluten-free pastry and a rich filling. Delicious with a green leafy salad. Each slice provides 465 kcal, 20g protein, 5.5g carbohydrate (of which 4.5g sugars), 40g fat (of which 7g saturates), 0.5g fibre and 1.6g salt. Preheat the oven to 200C/180C Fan/Gas 6. Grease a 24cm/10in tart case with butter. Pulse all of the pastry ingredients except the eggs in a food processor until it resembles breadcrumbs, then add the eggs. Pulse again until the mixture starts to come together as a dough, then press the dough into a smooth ball, wrap in cling film and chill in the fridge for 10 minutes. Turn the dough out into the prepared tart tin. Use the palm of your hand to squash the dough evenly over the base of the tin, then spread and smooth it into the edges and sides of the tin using your fingers. Trim away any excess using a sharp knife, then line this pastry case with a sheet of greaseproof paper and fill with baking beans. Return to the fridge for 20 minutes. Blind bake the pastry case for 10 minutes, then remove the baking beans and greaseproof paper and bake for a further 8-10 minutes, or until pale golden-brown. Meanwhile, for the filling, beat together the yoghurt and eggs until well combined. Stir in the parsley and lemon zest, and season with plenty of pepper and a little salt. Set aside. When the pastry case is cooked, reduce the oven temperature to 190C/170C Fan/Gas 5. Arrange the spring onions in an even layer in the bottom of the pastry case. Arrange a layer of spinach on top, then place the chunks of mackerel onto the spinach leaves. Carefully pour over the yoghurt-and-egg mixture and dot the surface of the tart with the cherry tomato halves (cut-sides facing upwards). Bake for 25-30 minutes, or until the filling has set and the top has turned golden-brown. Serve warm or at room temperature, with a side salad of simply dressed watercress leaves.